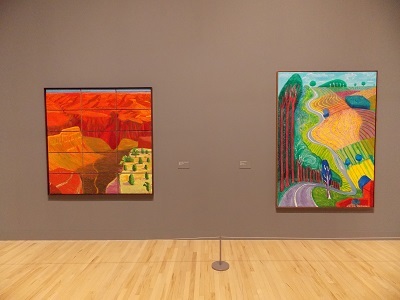 Tate Britain presents an exhibition that is the most extensive retrospective of the work of David Hockney. 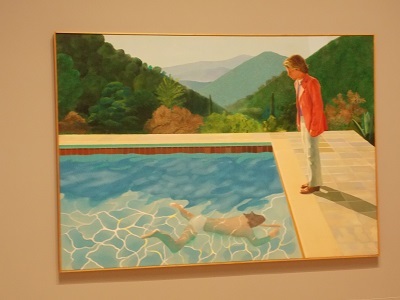 Hockney is considered one of Britain’s greatest living artists and this exhibition explores the artist’s achievements in painting, drawing, photography and video. 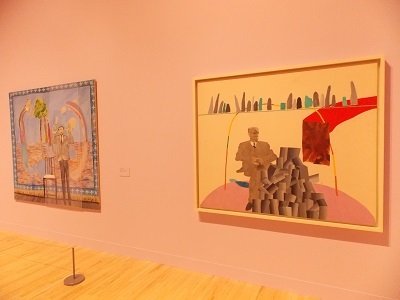 The exhibition begins with a room that illustrates Hockney’s remarkable ability to use different perspectives to create an illusion of reality that challenges the viewer to question some of their assumptions. In the exhibition, it soon becomes apparent that Hockney from his early works introduces an element of parody and humour to question the conventions of pictures and picture making. In the room entitled Demonstrations of Versatility, Hockney displays his ability to play around with different styles and subject matter. 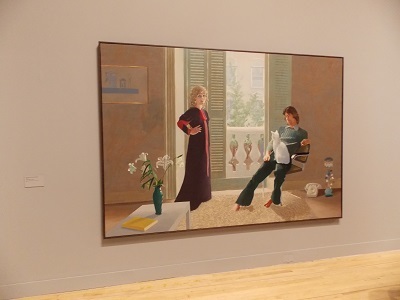 The free flowing Love paintings of the early sixties are followed by a more focused Domestic Scenes where the relationship between couples featured in the paintings is often left ambiguous. It was in the mid sixties when Hockney first visited Los Angeles and was fascinated by the architecture, geometry, light and people of the city. A series of paintings illustrate some of these themes including the well known images of LA Swimming pools. 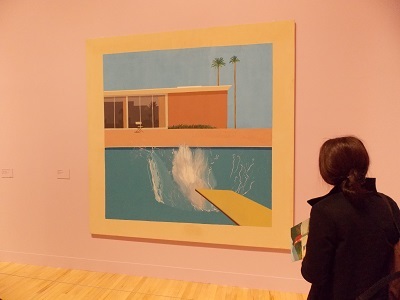 In the late sixties, early seventies, Hockney returned to more domestic scenes with a number of double portraits including two of his most famous works, Mr and Mrs Clark and Percy (1970-71) and Portrait of an Artist ( Pool with Two Figures). 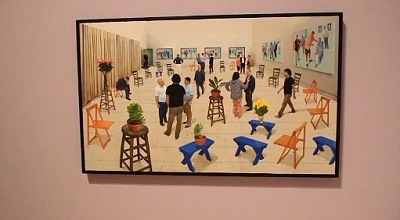 During the eighties and nineties, Hockney experimented with photography and collages to find pictures that could accommodate different perspectives. Many of the paintings at this time followed similar themes but more in relation to landscapes. 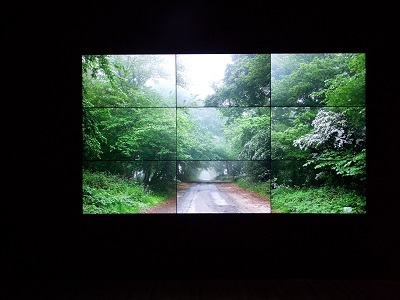 The idea of place becomes increasingly important for Hockney in the late nineties when he produced a series of paintings that reflected the landscapes of Yorkshire and Hollywood. 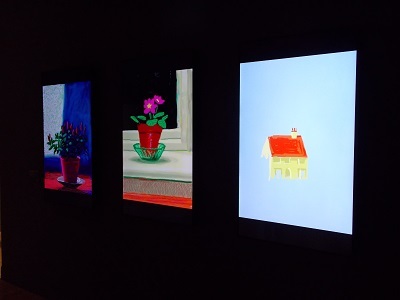 In the 21st century, Hockney experiments with new media with a multi-screen video work called the Four Seasons and his paintings and drawings created on a iPad. This fascinating and entertaining exhibition provides plenty of evidence of Hockney’s impact on post-war art. With his wit and humour, Hockney’s work has found its way into popular culture and been endlessly the source of inspiration for different generations of artists. 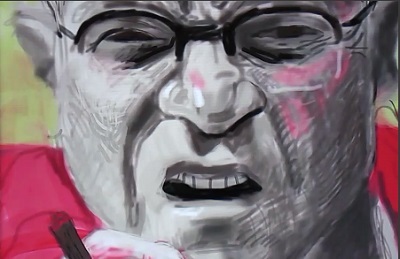 In many ways , his art is typically British with its use of parody and self-deprecation but manages to have a universal appeal with his use of colour, light and engaging subject matter. Following its presentation in London the exhibition, organised in collaboration with the Centre Pompidou and The Metropolitan Museum, will tour internationally to Paris and New York. Since our launch in January 2014, we have attracted thousands of readers each month, the site is constantly updated. By londonvisitors2014 in Exhibitions on February 6, 2017 .